In the 1980s, researchers identified a list of proficient reader strategies. In 1992, Pearson et al advanced the understanding of teaching comprehension by studying how to teach children to use the strategies. Later, in their book Mosaic of Thought: Comprehension in a Reader’s Workshop (1997 and updated in 2007), Keene and Zimmerman added sensory imaging to the list. When working with my students, I identify 9 goals that become 9 units of study. Although proficient reader strategies cannot be taught in isolation, it is helpful to identify one strategy a month on which to focus. Please understand that because students naturally use several strategies at once, they should not be limited to discussing only on strategy at a time. I realize that there is so much to talk about and never enough time, but it is well worth the effort to take 4-6 weeks to study 1 strategy at a time IN DEPTH. In order to help everyone be successful, I teach anchor lessons to the whole class and mini lessons to small groups. Then, the students investigate a strategy together and demonstrate to the whole group how to use that strategy. Eventually, all students understand how to use each reading strategy by itself and in combination with other strategies. Readers are confident in selecting appropriate strategies for specific reading tasks. IMPORTANT NOTE: If you are in a school where many or all teachers are setting up proficient reader classrooms, you will no longer need a monthly timeline. When kids come to you with a working understanding of a strategy, you will only need to fine-tune with more challenging texts. That will give you more time to differentiate your work on strategies depending on the needs of your students. Often, connecting, inferring, and determining importance are more troublesome for readers and you may need to work longer in those areas. Remember, THERE IS NO RIGHT ORDER FOR TEACHING THESE STRATEGIES. Since we use them all at once anyway, create a timeline that works for you and your students. Monitor comprehension: Children use a variety of monitoring comprehension strategies to make sure they understand texts. Students learn to pronounce words, determine meanings in context, and figure out words using knowledge of root words, prefixes and suffixes, among other strategies. They learn to figure out the meaning of unfamiliar words by figuring out how to pronounce words and inferring from context. Connect: By learning to explain how connections help readers understand texts, comprehension improves. 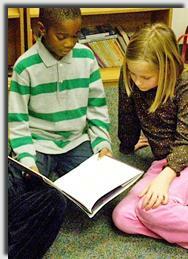 Children deepen their understanding of text by accessing their prior knowledge before reading a selection. Students practice thinking about what is misunderstood and applying what they know to repair meaning. They learn to apply connections to get meaning from a selection that is originally confusing. Students begin to dissect and discuss author’s literary elements - like metaphors - to deepen their comprehension. It’s usually a big surprise to teachers that a major test item for connections is whether students understand metaphors. Retell: Students build on their knowledge of retelling to recall important details. Students learn to discern what is most important to use in the retelling. Learning to retell a story thoughtfully is critical to learning to write a story and understand texts. Sometimes the child practices, referring to the book constantly, until the story is learned and the child feels confident enough to share. Students can use retelling cards, small props, puppets, story guideline posters, and even the book to help them as they learn to retell. As an assessment of what the child understands about the story, the child retells without rehearsal. Summarize: Students break longer selections into smaller parts and summarize each part in as few words as possible. By summarizing in this headline-writing fashion, readers sort out main ideas from details of a text. Question: Students learn to ask questions before, during, and after reading and to seek answers to deepen their understanding of the text. By bringing their own questions to small groups, students examine what they don't know and get help in comprehending. Students classify questions to help them learn to ask better questions. Visualize: Students learn to visualize the details of a text. The broader goal Keene and Zimmermann outline for the unit is learning to use all sensory images. Readers learn to visualize events and characters as well as determine emotions and imagine sights, sounds, and smells to assist them with comprehension. Students recall information by referring to their mental images. Students infer what words mean by creating a logical mental image for new vocabulary. During this unit, students dramatize, draw, sketch, move, and use all their senses to help them better understand what they are reading. Infer: Students learn to infer (and predict) information before, during, and after reading. Predicting is a part of inferring. To infer, readers notice references in the text and mix the new information with personal background knowledge to draw correct conclusions. Students practice inferring what words mean, settings of stories, answers to questions the reader has, to what pronouns refer, how to use text to understand characters, separate facts from opinions, explain events and determine themes. Learners distinguish between inferences, assumptions, and opinions by backing up their conclusions with evidence. As we continue to grow as proficient readers, we devote 6 weeks to studying inferring and how it integrates with all strategies. Determine importance: Separating out what is important from what is not and combining the new information with background knowledge is the heart of the definition of comprehension. Readers determine what is most important at the word level first. Students collect the most important information from the pages in order to comprehend main ideas and themes of texts. Readers discuss what is important from what is not at the whole-text level. Students discuss nonfiction during this unit because what is most important is less ambiguous than in fiction. Synthesize: Students stop often while reading to synthesize the information gained from texts to form opinions, cite evidence to support their conclusions, change perspectives, develop new ideas, and, in general, enhance a personal understanding of the concepts presented in a text. A strategy is a goal we work on for a very long time before mastering it. A skill is something we do automatically. In reading, we will continue to master the 7 proficient reader strategies with increasingly difficult texts into our adulthood. On the other hand, our state curriculum and the Common Core mandate what skills we teach for each grade level. I offer of the strategies and skills and how they played out in North Carolina in my 5th grade as a template for how you might develop your units of study. Read my perspective on strategy vs. skill. Get "Karen's Top 5 Strategies For Creating A Proficient Readers' Classroom"
"7 Proficient Comprehension Strategies Literacy Units"
"Metacognition is a powerful tool for understanding reading and improving reading comprehension, and can be used by all teachers and in every classroom where reading occurs and comprehension is a component of instructional outcomes." (Block & Pressley, 2002; Israel, Block, Kinnucan-Welsch, & Bauserman, 2005).